There was a pretty big bridal show in Texas this past weekend that is making headlines all over the U.S.
Maybe you've seen my previous post about Amazing Wedding Cakes? (If not, go take a look at some of the pictures). Those were thought to be pretty extravagant--a beehive cake? Come on. If you ended up heading over to the website and looking at some more pictures, you may have had the same jaw-dropping experience as me. This next story blew me away. 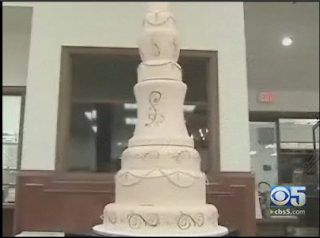 The cake-of-the-day is 9-tiered, and serves 320 people. Each slice of this cake has a projected price of $3,125 per slice. This cake is going for $1,000,000 (cue in creepy Dr. Evil voice here). It's so much money, because the decorations are diamonds and sapphires. Wow. Do you get to keep the diamonds/sapphires with your slice? I can't imagine having that kind of money ever to spend it on a cake. What would you do with $1,000,000?